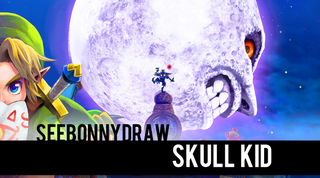 SeeBonnyDraw: Skull Kid! In Speed Painting Form! This past weekend, Nintendo released the remake of the cult favorite Majora's Mask for the Nintendo 3DS! To commemorate the occasion comes a speed painting of the titular entity and antagonist - Skull Kid and the raging Moon! Feel Free to watch the speed painting process before or after the write up! So I would say I'm a big time Nintendo fanboy and an even bigger Legend of Zelda fan. That said, Majora's Mask has been the one game in the franchise that has evaded me. I didn't get a lot of games growing up and relied on awesome friends to let me borrow their copies to enter the worlds we all know and love. Thus, I don't have a personal connection to the series (yet!) but the fact that it comes from the realm of what I adore so much still made this painting session genuinely exciting. Skull Kid, Majora's Mask, the Moon...all these characters are iconic and have so much strength in their visual nature that it was easy to get the ball rolling and see this thing through. Skull Kid I referenced from Smash 4's assist trophy, and the moon I referenced mainly from Hyrule Warriors actually. Of course, I had to play up the colors and got a certain kick out of painting the moon in a plethora of rainbow hues that I think really enhances his design. I went a bit overboard with him but kept Skull Kid in a more managable palette. I painted his body with scratchy lines to give the straw like texture for the clothes he wears, and that black outline really helps make him pop. This time around, I didn't go with any commentary and just mixed several audio tracks to the series with some fun little sfx from the games. Although mixing can be time consuming, it's a ton of fun to get those effects and music set up to meet cues and what not. Last week's Michonne video had a fun little mini battle with a zombie early on and the week before with Arrow I got to record my own opening to the "show" set to the Arrow' intro music. That kind of stuff is a blast and is an art in it's own way. Okay gang! That's it for this weekend. We'll be starting up another week of One a Day, so get ready for that. Hope you've had a nice Valentine's day as well! SeeBonnyDraw: Michonne! in Speed Painting Form!